Today, I had my first class of VCE Algorithmics. This is a computer science course that will be part of the Victorian Certificate of Education for the first time in 2015. Like many other schools, we have a week's "headstart" at the end of this academic year. My class is made up of six girls and me. Four of the girls are in year 11 and the remaining two are in year 12. As for me, I am out of school and in my forties! We will learn much and solve many problems together and I have been waiting impatiently for the course to get under way. Given that the textbook is yet to be published, I took the opportunity of this week to lay some ground in "algorithmic thinking". 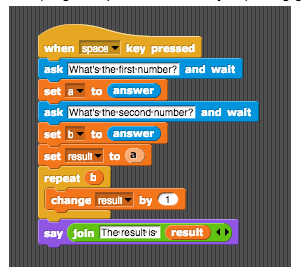 The students looked at a few algorithms today and decided what each of them accomplished. Here is one. Do you know what it does? If you want to work it out for yourself, stop reading! Well, let's say the user provided the input 4. This algorithm will add 4 to itself 4 times (result = 4 + 4 + 4 + 4). In other words, it will compute 4 x 4. As the students tried different examples of the input, they figured out that this was a squaring algorithm. For homework, the students will read a chapter of Algorithmic Adventures and answer some questions that should lead them to an understanding of what an Algorithm is. Since I think none of them knows about my blog, I think it safe to share some information with you! An Algorithm is similar to a cooking recipe in that it provides steps for reaching a desired result. However, an algorithm also differs from a cooking recipe in that it has to be specific and precise to the extent that all computers can execute it and produce the same output given any particular input. It cannot have fuzzy operations like "simmer sauce until thick" if different computers have different ideas of what "thick" means. Also, an algorithm has to work in a finite time and produce the correct output for all legal inputs. 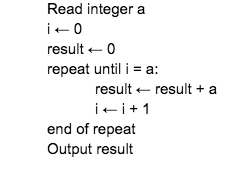 So, a series of steps that asks for an integer and fails when the user enters a negative number is not a legitimate algorithm. On Thursday and Friday, we will write develop our own algorithms and write some computer programs. I hope to have the opportunity to blog about it. Until then, here's another algorithm for you to guess the function of. This one is written in Scribble, a variant of SNAP! It's going well, thanks. The girls are working with interest. The work itself is very interesting and I really should be blogging about it. I just have been so busy in and out of school! By the way, we're now 8, 5 year 11s, 2 year 12s and me. Hi I'm a student who is doing algorithmics this year. Needless to say I am pulling my hair out, it wasn't taught that well at our school. How did you get your girls to prepare for the exam? Sorry to hear this, Anonymous. I hope that you do well, irrespective of how you felt the course was taught. We had a couple of practice exams and we went through questions that the students found difficult. Some students needed encouragement to see me for a lunchtime tutorial so I could go over some personalised work with them. It is hard to prepare for an exam when there isn't a history of exam questions, as there would be for Maths Methods for example. I highly recommend going over all your assessments from throughout the year, especially the "written explanations". I also recommend trying to see your teacher for a tutorial either by yourself or with one other student who may be struggling with the same content. "Tuition" at this stage will work better than whole-class instruction.